Boundary Islet was recorded earliest in the Annals of Lingshui County ,which was compiled in the reign of Emperor Qian Long during the Qing Dynasty. It says that Jiashe Islet is located 40 li east to the county town and on the sea beyond the Jiashe Gully and 30 zhang high. The Jiashe Islet refers to Boundary Islet today. 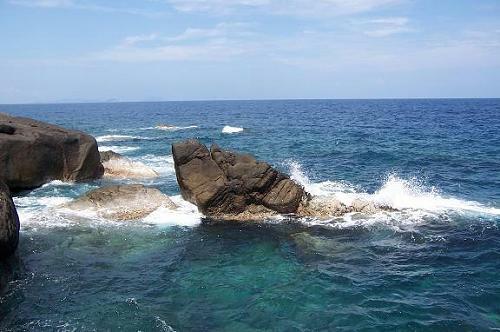 On the opposite shore of Boundary Islet is the Niuling Ridge, which is the demarcation line of the north and south of eastern Hainan Island. As to residents, the Han people live in the north and the ethnic Li people live in the south. As to geography, the north part is mainly plain but the south part appears mountainous area. This also results in difference in climate between the two parts, as the warm and wet airflows coming from southern sea area are always blocked by the ridge. Therefore, standing on Boundary Islet, you may often see a strange phenomenon; it rains in one side of ridge but sunny in the other side. The Lingshui River receives dozens of tributaries and empties into the sea. It is said that in the ancient times, five streams rising in the Wuzhi Mountain also converged into the river. One day, torrents of water rushed down the mountain with mud and sand and flowed into the sea through the Lingshui River. As a result, the clear sea became turbid. The dragonliving in the sea felt anxious and reported the situation to the Jade Emperor in the Heaven. The Jade Emperor came to inspect by mounting clouds and found that more mud and sand were pouring into the sea. The Jade Emperor worried about that the sea would be always dirty and thus dispatched a fairy ox descent to the world with a magic axe. The Jade Emperor ordered to cut down the southeast corner of the Wuzhi Mountain with the magic axe, and let the fairy ox pull the hill to the flood. The fairy ox worked for nine days and nights, But in the midway, a man found this and shouted: “look!” It is so strange that an ox pulls a hill on the sea. All farmers in the field stopped their work to see the scene. The fairy ox was frightened and halted. Soon, it changed into a ridge named Niuling(means Ox Ridge)and the hill changed into Boundary Islet. There is a sculpture on the beach of the island: a turtle baby is coming into the world by breaking its shell. The sculpture shows the attention and love to life, with a Chinese character happiness is carved on its back. 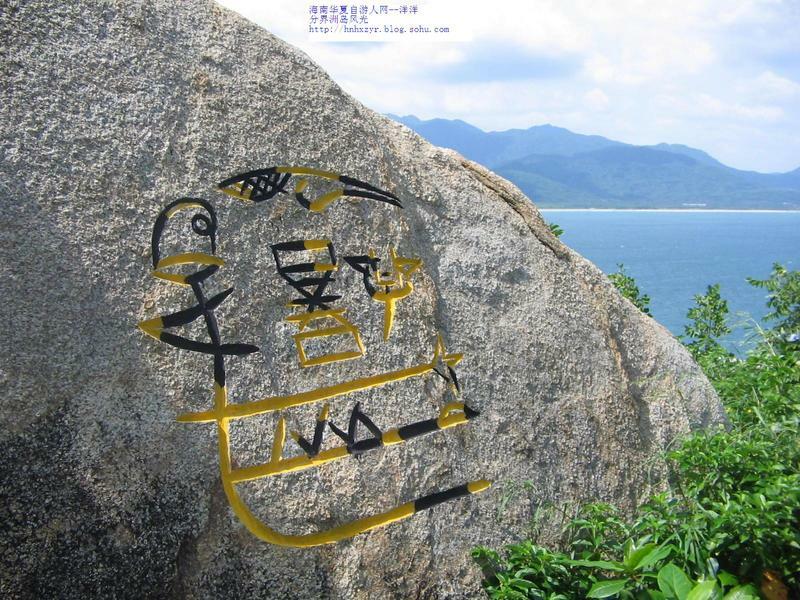 Also, other two Chinese character emolument and longevity are sculpted on rocks in the island, which is thus called the place of happiness and longevity. According to local fishermen, around the Mid-Autumn Festival on lunar August 15 every year, many green turtles swim to the island and lay eggs into the sand beach. Soon after, turtle babies will hatch with resort to the heat of sunlight, and climb into the sea and live there. In the eyes of Chinese, the turtle is a symbol of longevity. 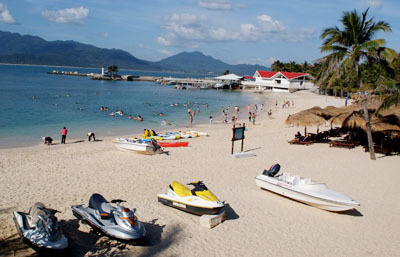 So, to travel the island is believed to bring you happiness and health. During the Song Dynasty, Boundary Islet was under the jurisdiction of Jiyang County. The county magistrate Zhou Kang once passed through the island and landed on it for being attracted by its special and beautiful landscapes. On the island, he found a rocky cave, which looked like a big room and was surrounded by tress, plants and flowers, and named it the Big Cave. Later, Zhou Kang went to other caver nearby Sanya and called it the Small Cave. And then he wrote the Travel Notes of Big and Small Caves. Today, people know more about the Small Cave but don’t know where the Big Cave is until Boundary Islet was developed several years ago. Now, coming to the Big Cave, tourists find all things ancient rattan, fig trees, stone table and chair—remain their past appearances. Local fishermen say that the spot has become their harbor from the wind for long time and their ancestors called it the Big Cave all along. During the Song Dynasty. 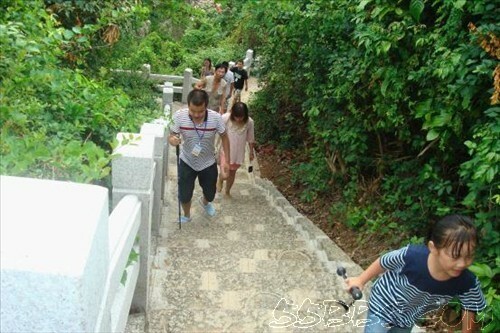 In his tour to the island, after finding the Big Cave, he wanted to climb up, to the top of hill and enjoy sea view and thus opened this path. At that time, he was transferred to the mainland for higher rank, so he praised the road meant boundless prospects. In Chinese, the two words prospects and properties have same meaning. So, people carve many kinds of coins have a good luck in earning money. In the water area for scuba diving, various types of colorful deer horn corals in green, red and gray widely distribute on the reefs and rocks. Some of them are in the shape of ball and same as red flower ,the others look like deer horn, so they are called deer-horn coral. A large number of tropic fishes such as blue dress, butterfly, angel and little zebra live among corals. Black sea urchins grow under corals, and dense seaweeds dance with the water flow. All these compose a wonderful undersea picture. There are a lot of jagged rocks of grotesque shapes in the submerged reef area, which look like ball, pillar, hill or others. The rare seven-color Christmas trees grow on the surface of reefs. They are in red, purple, green and other colors, looking like a brilliant garden. When a big fish swims nearby, they will draw back to the holes. After the water surrounding calms down, they will come out again. 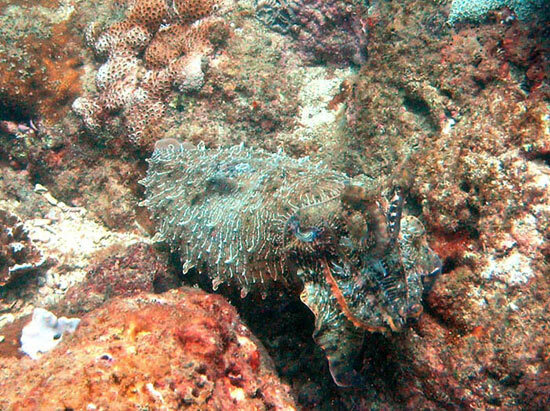 To dive among rocks and reefs is really an exploration for seeking novelty. 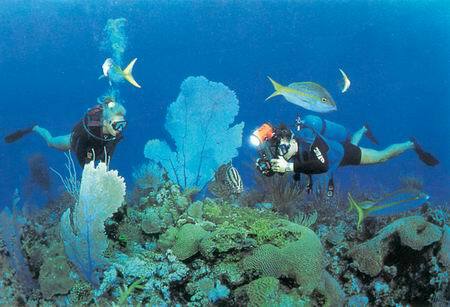 In the shallow area, the water flow is relatively smooth, and a group of large reefs are scattered on the sea bottom. A lot of marine living things concentrate on this area, including deer-horn coral, mushroom coral, sea cypress, sea fan, soft red coral and some small fishes such as little blue gem, little blue demon, black-white immortal and zebra. A handrail has been built up among the coral reefs, tourists can stroll among the corals with a glas helment, just like astronauts walking on the moon or floating in the space. Divers always wonder at the uncanny workmanship of the nature in this area when they see those magnificent erect cliffs. Here, they can fly among cliffs like birds, stand at the foot of cliffs to enjoy marvelous spectacle, or pass through the seaweed forests that grow on the cliffs. Also, there are some mystical caves on the cliffs, where some big fishes such as grouper live. 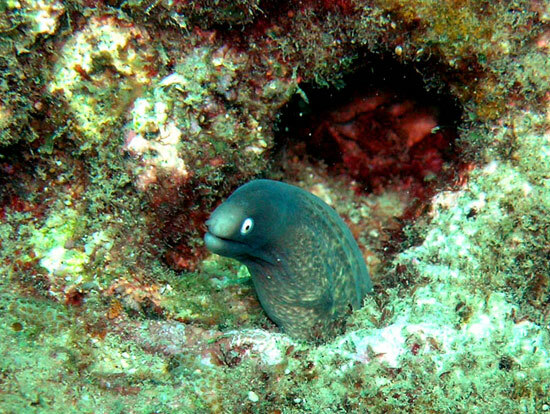 When divers come on, they may leap out of the cave and give them a shock. So, it requires divers have courage to dive in the caves, but all of them are proud of such an exploration experience. 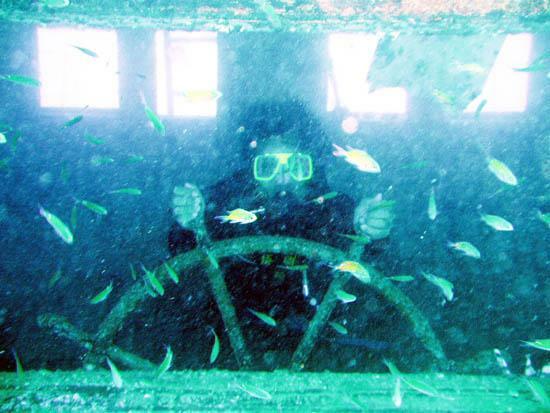 In the northwest corner of the island, a sunken iron-hull ship wreck has lain on the seabed for many years, and now has become a paradise of fishes. Tens of thousands of transparent pink fishes gather around the ship, looking like a red cloud from far away. A few big groupers and some unknown small fishes live together in the bridge in spite of a struggle for existence between them. In the face of the sunken ship and these fishes, people have to think such things as time and existence.